Step 4: We promote your new website - During the first 30 days of your service, our marketing experts will be submitting your website to Internet Directory Pages and search engines such as Google™ and MSN®. Our experts take care of everything for you! 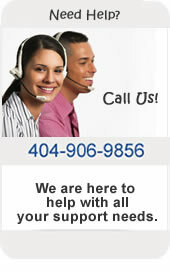 You can call our customer support team at 404-906-9856 Monday through Friday 8 a.m. to 7 p.m. EST. Whether you want to make changes to your website changes, have questions about promotional activities or what to walk through the details on your Internet Scorecard, a live web expert is just a phone call away!